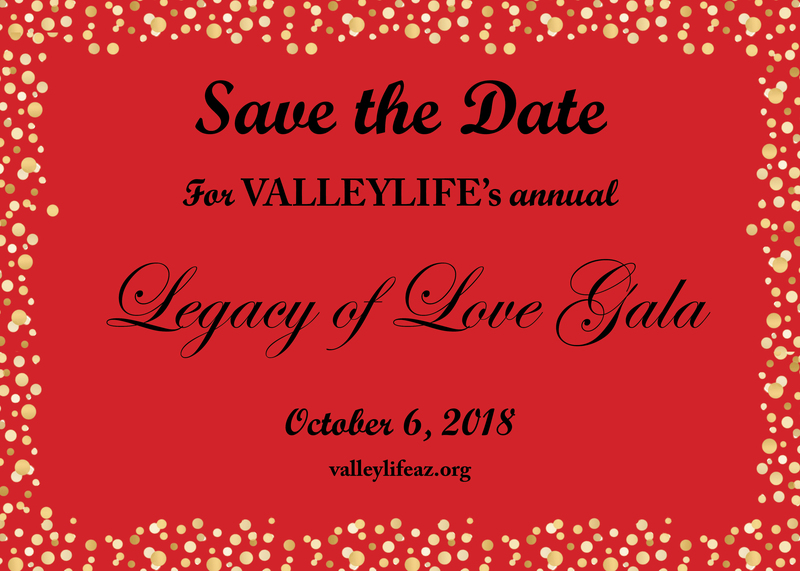 Join VALLEYLIFE in celebrating 71 years of providing services to individuals with disabilities is the Phoenix metro area at VALLEYLIFE’s annual Legacy of Love Gala. The Legacy of Love Gala will be held on October 6th at the Sheraton Crescent Hotel. Chairs for the 2018 Legacy of Love Gala are Ashley Collins and Vaughn Kelley, and Amy and Brian Winski. Honorary 2018 Gala Chairs are Juanice and Arthur Oldham, and Jessica Wert Hunsaker and Caleb Hunsaker. JoAnn and Tim Holland retain their position again this year as the Honorary Chairs Emeritus. The evening will begin with cocktails and a silent auction at 5:00 p.m., followed by an ambrosial dinner at 7:00 p.m. The evening’s program will feature a banquet, live auction, concert with a surprise celebrity performer, dancing, and performances by VALLEYLIFE’s Glee Club and Dance Troupe. To purchase a ticket or view our available sponsorship opportunities please visit www.valleylifeaz.org/events. Join VALLEYLIFE’s mission “to enhance the quality of life of people with disabilities,” and celebrate 71 years of providing services throughout the Valley. Founded in 1947, VALLEYLIFE is committed to helping people with disabilities by enriching their lives with rewarding experiences and valuable opportunities, and enabling them to live a life with choices, independence and dignity. VALLEYLIFE’s services are delivered through caring and dedicated staff, specialized programs and advocacy. VALLEYLIFE provides Residential Services, Day Services, Home and Community Based Services and Vocational Services to people with disabilities. Residential Services currently operate 27 licensed group homes, which function like traditional family homes. Day Services provide programs designed to improve independent living, social and recreational skills, and offer opportunities for community involvement. Home and Community Bases Services provide valuable support to people with disabilities and their families in the comfort of their own home. Vocational Services provide opportunities for people with disabilities to obtain and maintain meaningful employment through job search and placement, job coaching and development, and training opportunities. VALLEYLIFE also operates a commercial printing company, Williams Express Document & Print Services, as well as an on-site production center, janitorial, retail and restaurant services. Next articleVideo – Hale Theatre Announces 2018-2019 Season!